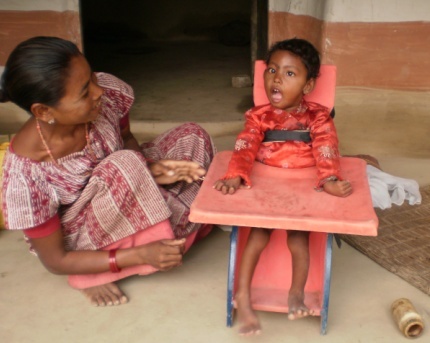 Objective of rehabilitation is improvement of the lives of children with a disability living in our project villages. This is planned through local solutions so that the support becomes consolidated in the local community, realising that these children become an asset for their families and the society in stead of a burden. Karuna tries to realise her mission through two different projects. We have achieved concrete results of the completed activities. At this moment much effort is being put in gathering information on the improvement of the quality of life from the perspective of the families and children themselves. 276 children with a disability in the current 7 Share&Care villages who all get the services they need according to the individual plan that has been developed together with the parents. 50 children are completely rehabilitated and have no disability anymore. 163 children had the medical treatment they needed. 86 children got an assistive device (glasses, hearing device, wheel chair, etc.). 241 children got physiotherapy treatment, including also the parents so that they are able to continue the physiotherapy with their children. 224 children received a scholarship through other organisations. 31 children have been enrolled in regular and specialized education due to the Share&Care program (before the program they didn’t go to school). 30 young people with a disability got vocational training. 42 families with a disabled child participate in the livelihood program. 134 children received an identity card through which they can receive limited financial support and special provisions. In all the villages awareness activities take place through cultural programs, street theatre by children with a disability, as well as campaigns. 11 community rehabilitation facilitators have been trained to provide the necessary support and rehabilitation and educational services. 78 children are organized in self-help groups. 266 children with a handicap have been identified in 7 Prevention & Rehabilitation villages (2 different districts: Sunsari and Rasuwa). In these 7 villages a Village Development Rehabilitation Committee has been formed with which an agreement has been signed. In the villages a community based rehabilitation facilitator has been selected and trained. On average 35% of the total project costs (2000 euro per village) has been mobilized locally.